"Hier begegnen symphonische Cinema-Sound-Elemente zarten Klängen und Handgemachtes dem Programmierten. Ein Genre für VOODOO TRAVEL gibt es nicht, vielmehr besagt der Titel, dass es sich um eine Reise handelt - und die bringt den Zuhörer auf abgelegene Pfade zwischen skurrilen Absurditäten und poetischem Sound-Design. Im Zentrum des Ganzen hören wir die Stimme von Howard Fine, ein irrwitziger Sprachkunstwerker und ein Meister darin, Sprechgesang mit Rap-artigen Akzenten ruppig und gewitzt zu verknüpfen. Das Album ist auf seine eigene Art hinrteißend, sicherlich keine leichte Kost, vielleicht ebenso tiefgründig wie ein surreales Gemälde Rene Magrittes. Man begibt sich in einen Klangkosmos, der wahre Juwelen hervorzaubert, denn die Sounds sind auf höchstem Niveau berauschend und perfekt inszeniert. Empfehlenswert!" "Ein Album, das sämtliche Rahmen konventioneller Hörgewohnheiten sprengt. Programmusik fürs digitale Zeitalter ist VOODOO TRAVEL geworden... eine spannende Vision für die Zukunft: Nicht das Stilmittel, sondern die Kunstidee zählt mehr denn je. Im Bus der Ströers und Howard Fines wird gelebt, nicht gelitten. Gute Entdeckungsreise!" "The subject is consciousness itself in it's apprehension of the current quantum of consensual reality. The simple words of poetry accumulate to paint a complex picture of the way things are, with music drawing from decades of jazz, slowed down hip hop beats, a nod to Rat Pack era crooners, and backing singers similar to Percy Faith or a Japanese girl band. There is a balance of sincerity in the construction of the lyric and a tongue-in-cheek half sung/half spoken delivery with an edge to it like Fred Schneider of the B52s at a poetry jam improvising a book of philosophy for aging children. Musical settings and sonic devices are controlled and fashioned to the lyric as tightly as a Schubert art song or a John Adams opera. The effect is to delight the listener in to a guided meditation on the paradox and mystery of life in a post-industrial world. It's a suite of songs delivered by a trickster in a dream. One suspects this coyote has been hurt into his poetry. He suffers from the people wound and knows his bar code labels him with an expiration date in this world where nobody gets out alive. He's seen revolutions come and go to no particular point. So he's become a snide showman, slight of hand philosopher, and parabolic storyteller with a hidden desire to mourn the losses in a collective of like minded dreamers. He's sick to death of the sickness unto death and like to laugh at existential despair while dancing with a cane in hand, top hat cocked to the side, and a sidelong pickerel smile. This album is a tricky thicket of wisdom literature served on a bed of sparkling eclecticism, arranged with swirls of sonic cinnamon and baked with a smile in a crematorium between a disco and a monastery somewhere in Europe as a Trojan Gift Horse for the common man. It is ill advised to look a gift horse in the mouth. This particular pony is a good ride." "It's been a long time since that April in 1986 when the winds of Chernobyl blew through Munich, spoiling the milk for a week (they said) and the sense of safety one felt laying out naked on the grass of the English Garden with a pretzel and a beer. That was the year when the Stroer Bros. and Howard Fine unleashed their last album together, Nomaden, on the public. Their new CD, Voodoo Travel, begins with a little space age chamber music and by track two it is clear the DNA of that powerhouse band in 1986 is still intact. The brothers can still work it out like sparring helicopters and Howard Fine has lost none of his conspiratorial immediacy. After 24 years I assumed he was either in an ashram or was a victim of spontaneous combustion. The music is bigger this time, occasionally cinematic and still difficult to categorize. Percussive operetta? Spoken word funk? Poetry and music have rarely fused well in the past but when it works it is sublime. Successes include John Giorno with Glenn Branca (Stretching It Wider) and Allen Ginsberg with Marc Ribot (Refrain.) Stroer Duo and Howard Fine are in good company. This isn't the music you write email to, this isn't even the music you text to. It commands the room. On track five we hear the group can still walk the dreamscape with the familiarity last heard on Nomaden. Put it this way, if you think you have heard all the music in the world and it was a great ride but hey, you're over it, then Voodoo Travel will be a welcome surprise." 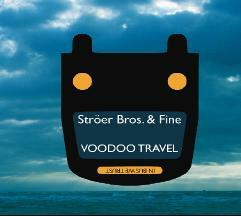 was produced 2001 - 2010 by Ströer Bros.
All recordings and mixes engineered by Ströer Bros.
© ℗ 2010 Ströer Bros.